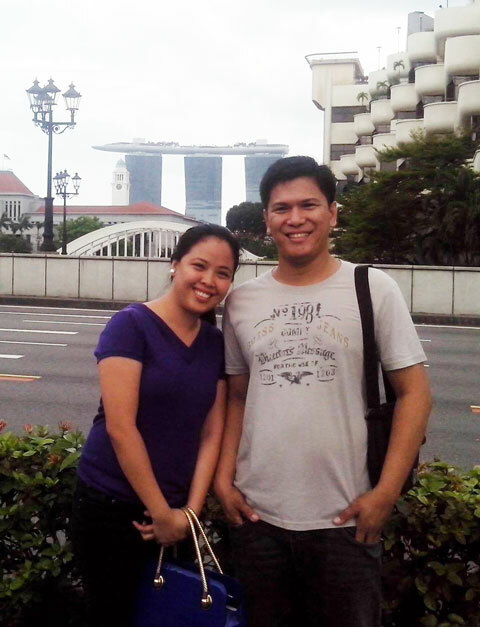 JAMES AND AGAPE BERMEJO are both children of Grace believers in the Philippines and graduates of the TCM’s IGBI-Ozamis Bible school as well as Grace Theological Center for Missions (GTCM). James also holds a university degree in English. Over the past 13 years the Bermejos planted and pastored two urban churches in the Manila region. The Bermejos were initially challenged for mission work by TCM missionary Genesis Maraat in 2009 and engaged in subsequent communication about mission possibilities with Ben and Joyce Anderson. In 2015 James resigned from his secular job to attend the GTCM training. Read Team Cambodia's February 2019 newsletter . . . Click on Newsletter in the right sidebar. We believe the Lord has called and prepared us to be a part of His Global Mission as missionaries. It is very clear in our minds and hearts that God wants to establish and declare His glory among the nations (Psalm 96:3); He desires all men to be saved (1 Timothy 2:4); He instructed the Body of Christ to preach the Gospel to the regions beyond (2 Corinthians 10:16) and to make all men see the mystery (Ephesians 3:9). We decided to be trained and partner with TCM in accomplishing God’s Global Mission. After completing the two-month training at Grace Theological Center for Mission (GTCM October-November 2015), we started to pray for Singapore. Why Singapore? Because less than 10% are Evangelical Christians. We were sent as TCM Missionaries to Singapore in May 2016 where we made new friends and started a Bible Study discipleship/mentoring program and regular Sunday Worship and Fellowship. The challenge of staying in Singapore was far greater than what we expected. We were held at Singapore immigration in November 2016 and told not to re-enter Singapore unless we had an employment visa. We returned to the Philippines doing all that we could to acquire an employment visa while continuing to serve the Lord in whatever opportunity He provided. We were given the privilege to teach in TCM’s Bible School in Indonesia (February 2017) and in the second batch of GTCM training (April & May 2017). However, favor was not on our side in acquiring an employment visa for Singapore. Paul and his companions travelled throughout the region of Phrygia and Galatia, having been kept by the Holy Spirit from preaching the word in the province of Asia. When they came to the border of Mysia, they tried to enter Bithynia, but the Holy Spirit would not allow them to. So they passed by Mysia and went down to Troas. During the night Paul had a vision of a man of Macedonia standing and begging him, “Come over to Macedonia and help us.” After Paul had seen the vision, we got ready at once to leave for Macedonia, concluding that God had called us to preach the gospel to them. The TCM leadership decided to reassign us to Phnom Penh, capital city of Cambodia. After much prayer and meditation, we realized the Lord is doing a REDIRECTION in our lives for His Global Mission. The truth is, it hurts. But the Lord knows what’s ahead of us. Like Paul, who followed God’s leading resulting in the establishment of the Philippi Church, we also believe that divine redirection must begin with unconditional submission. 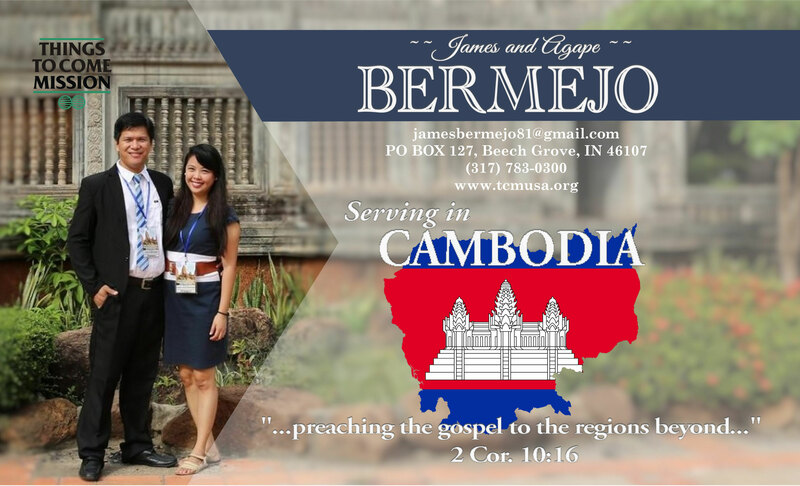 We have more information about the Bermejos in the TCM office! Please call us at (317) 783-0300.